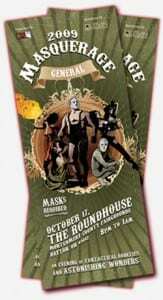 Do you have your Masquerage Tickets yet? There will be a party this Saturday at the Roundhouse on the Montgomery County Fairgrounds held by The Aids Resource Center (ARC). They are celebrating their 25th anniversary as a non-profit, community-based organization whose mission is to provide services to those infected, affected and at risk of HIV/AIDS. To this end, they provide comprehensive support services, HIV testing & counseling, prevention education, linkage to care, and advocacy. This Saturday is ARC’s largest yearly fundraiser, Masquerage, that is responsible for a large percentage of their yearly goal needed to continue the education in our communities. Masquerage is Dayton’s hottest “nothing-like-you-have-ever-seen-before” event, and this annual masked party is fast becoming THE event of the season. For the first time this year, Masquerage will feature a circus theme complete with performers, games, magic and even a circus “animal” or two. Guests will mingle with sideshow “freaks,” play midway games, have their fortunes told and be amazed by high wire acts. The non-stop entertainment features aerialists, sword swallowers, dancers, whip artistry, and other scintillating side show stunts provided by Freakshow Deluxe. And again this year, the Rubi Girls will perform a set we are not soon likely to forget! I’ll be there- but, you won’t be able to tell- because, I’ll have a mask on (and not that one). Get your tickets now, they are literally, the hottest tickets in town (you’ll understand once you get there). Next Post: Debate? What debate. Mayoral Q&A boring. We didn’t decide on the theme at your party though, the heads of our committee did that. BUT we did meet Rev. Gunn there (the head of Freakshow Deluxe) and that is how ARC found out they existed. So yes, your party was influential in the process. The ones I’ve been too were mostly fabulous, esp the one in the Merc in 2007 (which had a ’70s theme). I loved them also, but I have not gone to the Merc ones as I wish the Central Steam Plant was operational. :( I have been to the Roundhouse twice and the Cannery once. See you there again this Year.